It’s not uncommon for the gun owners to forget the combination or the key to their gun safe locks. Sometimes, the gun safe lock turns dysfunctional and the owner can’t access anything on the inside. If this happens to you, you can be assured that there are ways that might help you out of this predicament. You can break into your own gun safe and recover all the valuable content on the inside. But top quality gun safes are much secure and strong thus will take a great toll if you ever lose the combination or key. Keep reading to know everything about how to break into a gun safe and get a hold of your valuables once again. Combination locks are the most common type of locks that tend to get jammed. We’ll discuss how to open gun safe with a combination lock but you can apply these methods to almost any type of lock. Although it’s the most obvious solution to the problem, people often forget to call a locksmith when their safes get locked. Remember to call in a locksmith before you start to pry open the lock by yourself. A locksmith is a professional who would not only fix your lock but he also wouldn’t cause any damage to your lock and he’ll make it reusable. If you’re still wondering how to unlock gun safe, you can use the little space between the door and the body of the safe. Every gun safe contains this prying space. 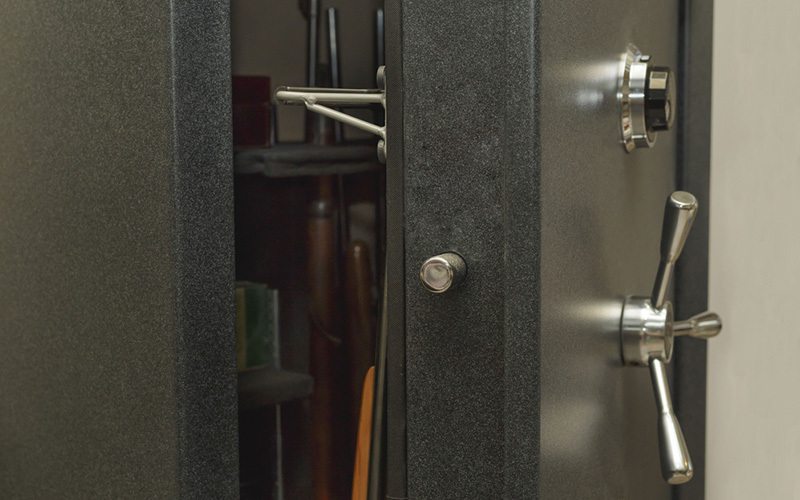 If the lock on your gun safe doesn’t work, you can use rod or bolts on the prying space to break into the safe. If the prying space is too narrow, use a powerful impact drill to make your way. make sure to use diamond drill bits while drilling. But your safe will become insecure after this and you wouldn’t be able to use it to store your valuables anymore. After you’ve found the prying space, push a rod or bolt into it. Push your tool outside and try to open the outside. Be careful not to let the rod hurt you. You’ll possibly fail the first couple of times but you can succeed after some time. Safes with a combination lock typically come with a key to override manually. You can find the key at the safe’s front near the dial area. If your model comes with such an override option, look for the key. It’s the quickest and safest way to get inside your locker again. Although this can’t be operated on every gun safe model, you can try this simple method with yours. A change key is a simple tool to reset the lock. But you’ll have to know the combination. To get to this key, you have to unlock the safe first and you’ll find a key on the door. You can take out this key while you have a functional lock on your safe and use the key to manually override later. If you use the key on the safe’s front, you don’t need to know the combination. And after this, you can change the combination to a more memorable one. Yes, you can actually open some of the gun safes using a magnet. This is a great and yet a simple method if you’re confused on how to unlock gun safe without key. You can find rare-earth magnets at the local DIY stores. The larger the magnet is, the more effective it is. Caution: due to the rare-earth magnet’s extreme power, electronics in the house can get ruined in seconds. So, make sure to keep the magnet away from all of your electronic devices. Don’t use the machine if you have a metallic device for medical purposes on your body, like a pacemaker. After you’ve obtained the magnet, get a tube fabric like a gym sock. You’ll need the fabric to move or remove your magnet. No matter how silly it sounds, it works for some models. Gently drop the safe or bounce a single side. This action will reset the lock, open the safe’s door and you’ll get access to the safe again. This is not applicable for large gun safes. But for locked small safes, it’s a very convenient idea. With the correct placement and techniques, you can actually access your locked safe by using a wire. No matter how thick and sturdy the door on your safe is, you’ll manage to find, at least, a tiny gap between the door and the safe’s body. You can use a wire, a paperclip or a flat plastic straw to insert into the gap and access the locking mechanism inside. Put one of your ears on the safe’s door and wait for a sound in the locking area while you’re holding the wire/paperclip/straw. When the lock gets a little knock by the wire, it’ll open. With this approach, your safe will remain intact and no damage will be done to the safe. Now that you know how to break into a gun safe, you don’t have to worry about your locked safe anymore. You can regain access to the firearms and valuables inside your safe with a little effort. If your gun safe has a warranty, you can also try contacting the manufacturing company and see if they offer any service.